I'm going to make this post a pretty quick one. It's Thanksgiving Eve: I've just finished baking five pies, I have a spaghetti squash roasting in the oven, and I have a batch of buttermilk biscuits to make. But I figure this recipe might actually be useful for tonight, when you need to rustle up a quick meal, or even the day after Thanksgiving, when you'll probably have random leftover vegetables. This recipe is awesome because you don't have to worry about exact measurements and knife cuts. In fact, if you don't have this exact ingredient list, improvise with a quarter of an onion, a few extra carrots, or maybe a half-cup of those frozen peas. For the first time ever, I took orders for baked goodies. Specifically, pies. 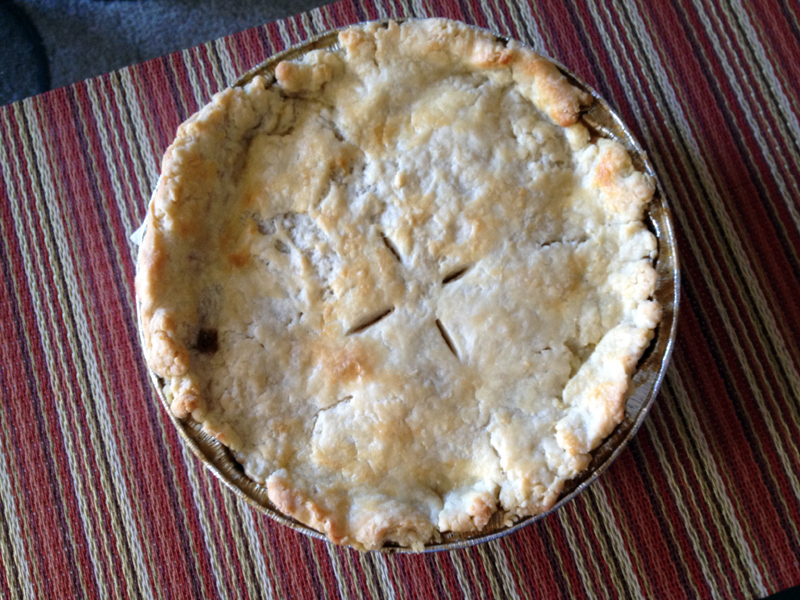 Strawberry pies, apple pies, pecan pies and a vegetarian pot pie. I had never made a vegetarian pot pie before but after doing some research, I decided to make one with assorted vegetables and a creamy white wine sauce. Of course, the wine was just an excuse to crack open the Viognier I had waiting in the fridge. 1. Make pie dough: In a food processor (yes, even a dinky small one, like the one I have! ), pulse together flour, sugar and salt until combined. Add butter and pulse until the mixture starts to resemble wet sand (about 3-4 times). Add apple cider vinegar and water and pulse until combined (about 3-4 times). Turn out mixture into a medium mixing bowl and knead gently (two or three times) until it just comes together in a moist mass. You may need to add another tablespoon or two of cold water. Form into a disk and set aside. 3. Make filling: In a large saute pan over medium heat, melt butter. Add flour and stir until combined. Add carrots, potato, zucchini and mushrooms, stirring until the mushrooms start to release their moisture, about 4-5 minutes. Add white wine and reduce to au sec (until the pan looks a little dry), about 1-2 minutes. Stir in vegetable broth, cream and thyme, and season to taste with salt and pepper. 4. Take pie dough out of fridge to let warm slightly. Turn off heat of vegetable filling and let cool slightly, about 5 minutes. 5. Pour vegetable mixture into an 8-inch pie tin. On a clean, flat surface, roll out the pie dough to just over 1/4" thickness, or just until it's large enough to cover the top of the pie. Layer on top of filled pie tin, securing over the edges. Brush with eggwash and slice 3-4 small vents in the middle of the pie. Bake in oven until the top is golden brown, about 20-25 minutes.